The SUPE-Collective presents and develops engagement and intervention into the field of Urban Political Ecology. We seek to provide a collaborative space for researchers from different institutions working in cities in the South and focused on developing urban political ecology. This section of the larger Situated Ecologies website emerged from ongoing debates and work at the African Centre for Cities between 2011 and 2013 that brought together a shared desire to generate new contours of UPE through our growing and changing understanding of African urban environments. This resulted in a number of outputs including: papers, conference sessions and presentations, a journal special issue and an ongoing reading group. From this beginning and interactions with a range of scholars, activists and policymakers, discussions began to focus on ideas about creating a wider platform for collaboration that could disseminate ongoing research, provide a space for debate, to organize workshops to develop skills, and to bring in other partners to develop new research projects and explore radical and critical perspectives on African urban environments. Central to our project is our desire to provide learning opportunities for young researchers in African universities to develop critical skills needed to interrogate these dynamics. Whilst there is a vibrant culture of urban scholarship in Africa, compared to other global regions university departments engaging in these issues are often under-resourced and struggle to link into global networks of knowledge exchange and development. To generate critical understandings of African urban environments that span multiple different contexts. 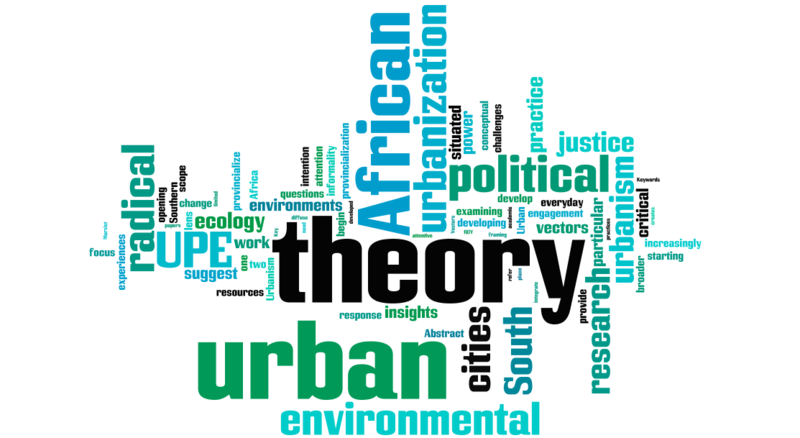 To provoke debate and discussion concerning urban theory in African and wider global South cities, particularly in the fields of urban political ecology and environmental justice. To support the development of early career urban researchers at African and wider global South universities.